Ebooks available the first month for just $3.99! In this slim new collection, critically-acclaimed author and journalist Joseph Vogel gathers together some of his most informative and provocative pieces on the late King of Pop. Featuring ten articles and a previously unpublished bonus chapter, this fascinating mosaic explores a wide range of subject matter: from the impact of race on Jackson’s career, to the ways he challenged and expanded the definition of “pop,” to behind-the-scenes histories of his songs. Based on original research and personal interviews with the singer’s close collaborators, Featuring Michael Jackson is a book no fan or music history buff will want to be without. BONUS CHAPTER: Have You Seen His Childhood? “To Lie And Shame The Race” | Jack. Michael. Muhammad. In their fourth series of educational short films, The Michael Jackson Academia Project finds some interesting correlations in regards to the deliberate and systemic destruction of Michael Jackson’s public image. These latest MJAP videos suggest that the methods of personal and professional destruction used against Michael Jackson were the same as those used against Muhammad Ali, Jack Johnson, and others. Michael himself mentioned Jack Johnson in an interview with Jesse Jackson (from 4:47-5:27), when Jesse asked Michael how he dealt with the pain of the allegations flung at him. Michael was very aware of this pattern of systemic destruction of successful black men in America. He had mentioned it in various interviews such as the aforementioned, and expressed his awareness of it and his frustration with it in many of his songs. Unforgivable Blackness: The Rise and Fall of Jack Johnson by Geoffrey C. Ward (2004). Unforgivable Blackness, a film directed by Ken Burns, is also available on DVD from PBS, along with a study guide for teachers. Muhammad Ali: His Life and Times by Thomas Hauser (1992). Huey P. Newton: The Radical Theorist By Judson L. Jeffries (2002). I also encourage you to read Dr. Sylvia Martin’s ‘The Roots and Routes of Michael Jackson’s Global Identity‘, just published in March of 2012. All of these resources will provide an important learning and teaching perspective in regards to the pattern of destruction brought upon these men once they became successful in a world whose ruling powers were determined to keep them “in their place” and if it could not do that, to destroy their professional and personal reputations in any way possible. A UK-based book enthusiast has located a book from Michael’s vast collection which was on auction in LA previously. 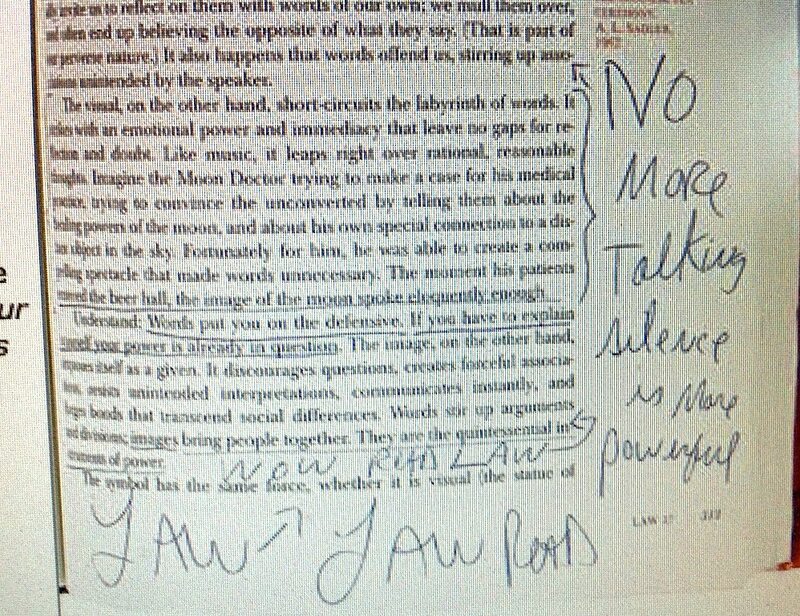 The book’s pages are annotated by Michael himself, who underlined some sentences and wrote his own notes in the margins. The Bookride piece goes on to describe The 48 Laws Of Power as “somewhat cynical and ruthless for a self-help book“. The book is pretty much described that same way at Amazon.com: Amoral, cunning, ruthless, and instructive, this piercing work distills three thousand years of the history of power in to forty-eight well explicated laws. As attention-grabbing in its design as it is in its content, this bold volume outlines the laws of power in their unvarnished essence, synthesizing the philosophies of Machiavelli, Sun-tzu, Carl von Clausewitz, and other great thinkers.